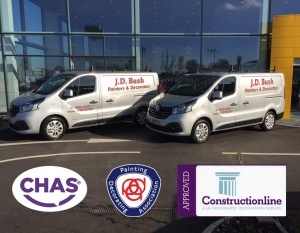 J D Bush Decorators Ltd is an established business which has been trading since 1993. Our areas of operations are across Kent, Essex, London & the Home Counties. We carry out various contracts up to the value of £1,250,000, i.e. New Build, Refurbishment, Industrial, Local Authority and Larger Private Sector Projects and undertake all aspects of painting & decorating. We are members of The Painters & Decorators Association & Construction Line. The Company is fully insured and CHAS Registered. Our management team & surveyors have a wealth of experience between them and would be happy to assist with all enquiries. We can work from drawings or bills of quantities and carry out site visits if required. With over 25 years in the decorating trade, we undertake all aspects of painting & decorating from large commercial buildings to niche residential work - no job is too large or small. We are members of The Painters & Decorators Association & Construction Line. The Company is fully insured and CHAS registered.